Or view larger version. Helicopter sprays tear gas on demonstrators on University of California, Berkeley campus. May 20, 1969. Lonnie Wilson, photographer. Gelatin silver print. Collection of the Oakland Museum of California. The Oakland Tribune Collection. Gift of ANG Newspapers. 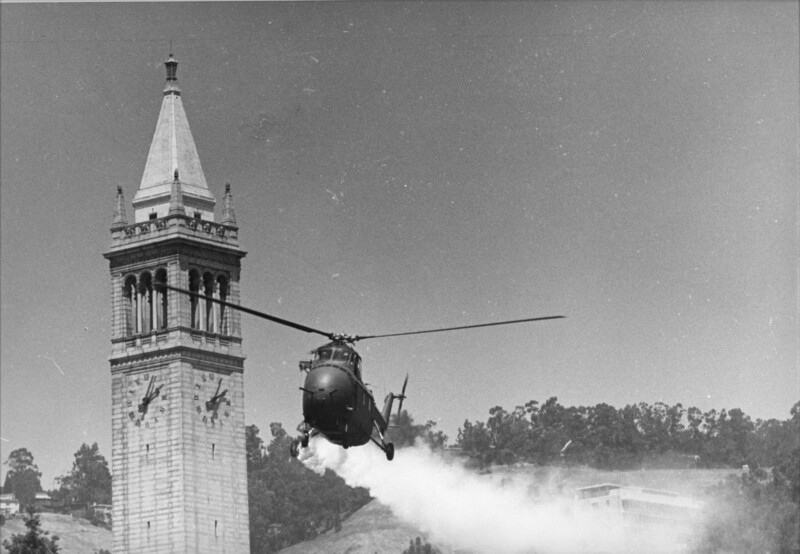 The photograph shows a National Guard helicopter as it flies by the Campanile on the University of California, Berkeley campus spraying tear gas on demonstrators in Sproul Plaza. Several thousand people appeared on campus at for a memorial honoring James Rector, the student who had been killed in the initial riot The National Guard had been ordered by Governor Ronald Reagan to break up the campus gathering sparked by controversy over People’s Park.